The exceptionally dry weather and then the tail end of the Northeast monsoon winds bringing a burst of rainfall to southern Johor and Singapore may have been the catalyst for a burst of flowering all over the island. 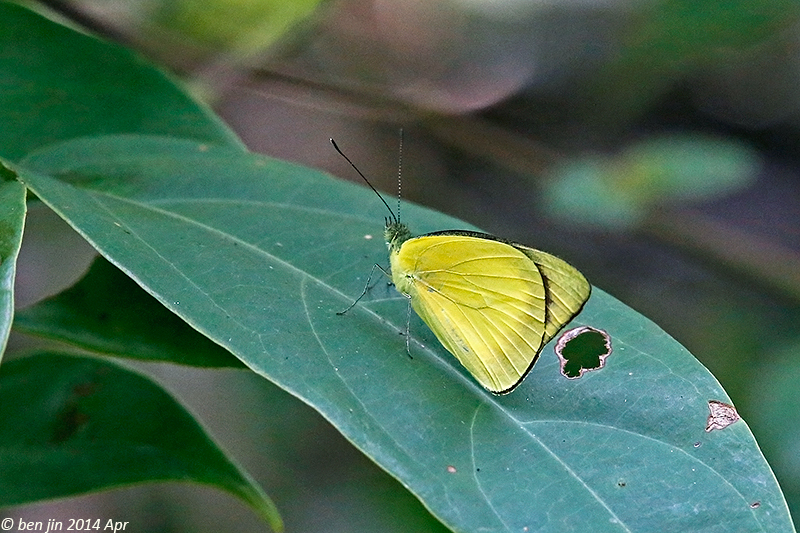 But it brought two new surprises as well, in terms of butterfly observations. Last Saturday, on his regular solo outing in the nature reserves, ButterflyCircle veteran Tan Ben Jin came across a rather large yellow butterfly that he had not seen before. 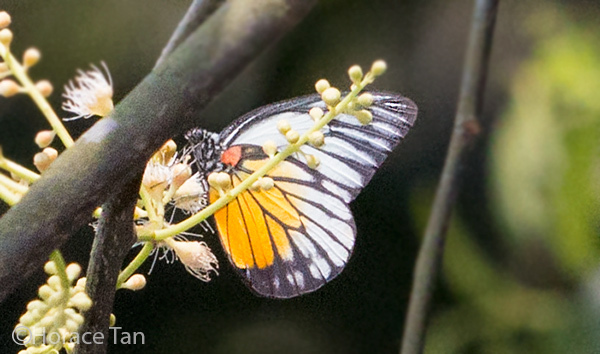 When the butterfly stopped to rest with its wings folded upright, Ben Jin managed to take a shot of it. It was something that he had not seen nor shot before. Upon posting in on ButterflyCircle's forums, Dr TL Seow identified it as a female Malaysian Albatross (Saletara panda distanti). It is noted that the Malaysian Albatross had the scientific name of Saletara liberia distanti in the references, but of late many authors have used the species name panda for the Sundanian species. Checking with our main reference for Malaysia and Singapore, "Butterflies of the Malay Peninsula, 4th Edition" by Corbet & Pendlebury, the Malaysian Albatross was recorded as extant in Singapore. W. A. Fleming's "Butterflies of West Malaysia and Singapore, 2nd Edition" also recorded the Malaysian Albatross in Singapore. During the period of the early 1990's to 2014, when the Singapore butterfly fauna was documented in earnest, there were no reliable sightings nor valid specimen records of this species. Hence Ben Jin's record of the Malaysian Albatross is taken as a re-discovery and recorded as species #310 in the Singapore Butterfly Checklist and classified as a migratory visitor. 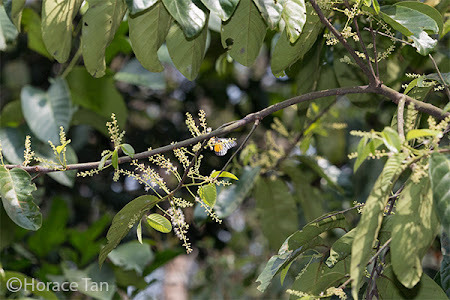 The following day, Sunday 13 Apr, ButterflyCircle member Horace Tan was out shooting some Chocolate Albatrosses in the nature reserves when he saw a larger butterfly feeding at the flowers with the Chocolate Albatrosses. 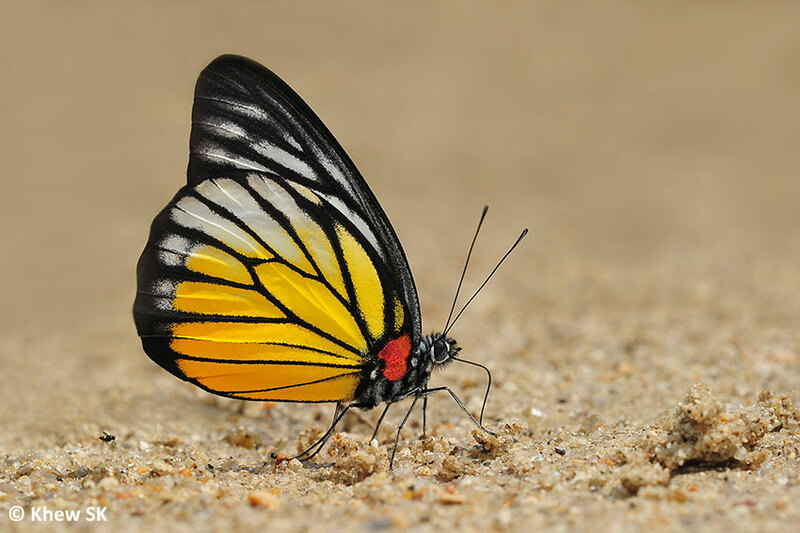 Initially assuming that it was a Painted Jezebel, Horace took a record shot of the butterfly and upon closer scrutiny realised that it was something else. It was confirmed as a Redspot Sawtooth (Prioneris philonome themana). This time around, both reference books did not indicate that the Redspot Sawtooth as an extant species in Singapore. Probably a seasonal migrant like many of the Pierids observed in Singapore from time to time, which includes the Chocolate Albatross, Wanderer and at least two more Pierid species collected in the 90's (to be discussed in this blog at a future time), the Redspot Sawtooth will be added to the Singapore Checklist as a new discovery and species #311. 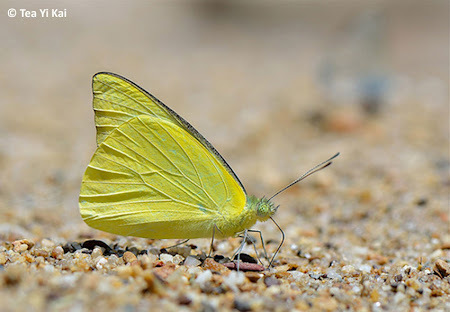 It is noteworthy that species from the family Pieridae are known to exhibit migratory tendencies, and there are periods when they are seasonally abundant, the northeasterly winds may have aided their flight into Singapore from Malaysia.